I flew into Ashgabad, arriving late at night. My guide was already waiting for me when I came through immigration, and drove me directly to the hotel. The hotel in Ashgabad was older, but nice. On the first day we toured Ashgabad. I heard about the Flaming Crater about 200 km (120 miles) north of Ashgabad and had my tour company arrange for a visit on that day, to stay overnight at the Flaming Crater. It was not on the original itinerary, but it was worth adding. Ashgabad itself is an amazing city. It has many hundreds of new buildings clad in white marble, it is quite extraordinary. 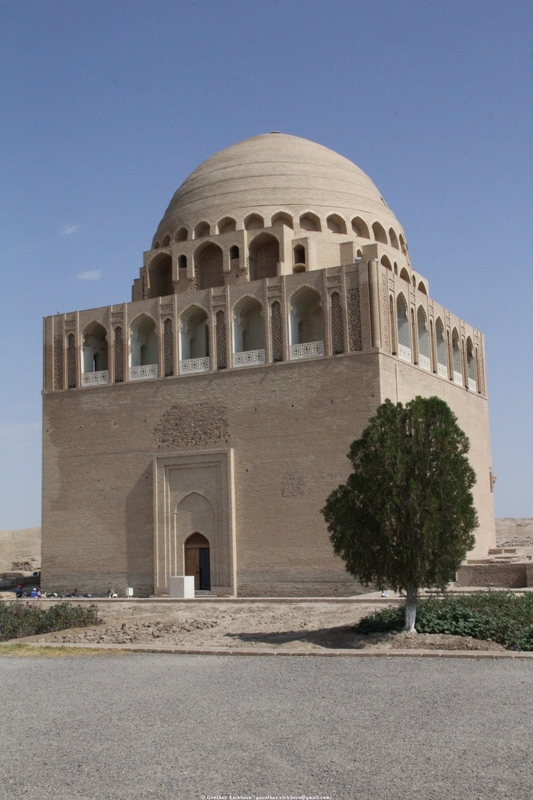 There are several interesting buildings and monuments in Ashgabad. The Flaming Crater is a site where they were drilling for natural gas. The drilling site exploded in 1970 and has been burning since then. It is an interesting spectacle, especially at night. The most fascinating sight was when I woke up in the middle of the night and looked at the burning crater. There were huge swarms of bats circling around the burning crater. It was amazing to watch. The next day we drove back to Ashgabad and visited several interesting sites around the city, including Nisa and the Kopetdag Mountain cable car. The next day I flew to Merv for a day visit. There are many interesting historical buildings in Merv, it certainly is worth a visit. In the afternoon I flew back to Ashgabad. The next day I flew to Dashoguz for a visit of Urgench, another city full of historical buildings. In the afternoon we drove to the border with Uzbekistan. Just like the other countries on this trip, Turkmenistan was not what I had expected. I expected drab Soviet style cities, dilapidated cars, and depressed people. It was quite the opposite, at least in Ashgabad, modern, busy, and people hanging on cell phones like everywhere else in the world. There were some areas that were not renovated, where you could still see the older Soviet style buildings. The villages lag behind the capital, but altogether I had a good impression of Turkmenistan. 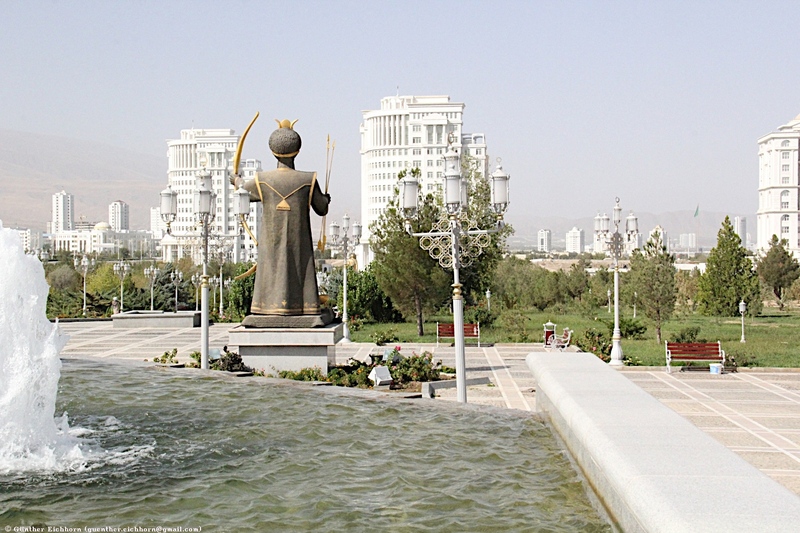 The main reason that Turkmenistan is quite well off is the fact that they have oil and natural gas reserves, which provides the money to erect the amazing buildings in Ashgabad. 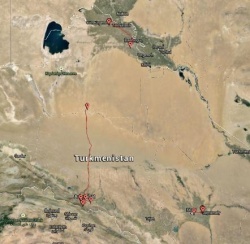 The old Silk Road went through parts of Turkmenistan. 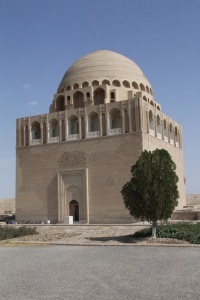 There are many historical monuments from the time of the Silk Road in Turkmenistan, especially in Merv. I was glad that I could visit these sites. One item that Turkmenistan is famous for are the carpets. As I understand it, you have to go through some contortions in order to be allowed to export any carpets. If you want to buy a carpet, make sure you get the right documentation to export it from Turkmenistan. The food was quite good, and beer was relatively inexpensive, although not quite as cheap as in some countries in Africa. I didn't have much of a chance to talk with people, very few people speak English or German. The few people I talked with seemed friendly. Turkmenistan is an interesting mix between modern architecture and historical sites from the old Silk Road. I am glad that I visited this country.